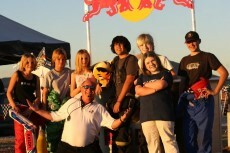 I made the 2day advanced racing school which bridges the gap from the 3day novice-racing school to the race weekends. I qualified to practice and race with the winged R/T 2000 (sequential 5-speed gearbox and BF Goodrich tires). What a great experience for me! Incredible what I learned during these short and very hot 3 days! To drive a Formula Dodge was harder than I thought. Many new friends and a lot of new knowledge was the result of this weekend. 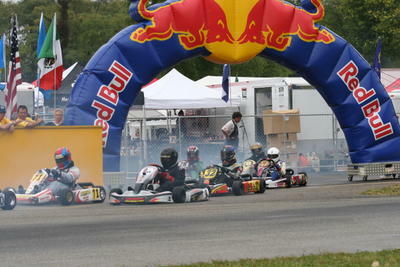 An exciting race with 15 Rotax Junior Drivers on the grid! We were all very close in times; me and Michael Leib had a great battle. ...Mrs Hawaii Tropic International raced in the TAG class! I started 5th and was up to 3rd when Jeff Pesner ran over me: my exhaust popped out and I had to stop and kick it back in.... I lost 1:40min with this incident, but I could finish the race with an exciting 5th place! 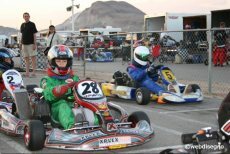 I finished 4th place in heat and main race in my new TonyKart Chassis at the LosAngeles KartClub in Fontana. I know I need more practice with the new chassis, because it is a lot different to handle, especially the brakes.... We met many nice people in Californa and I'm looking already forward to Grange on the next weekend! 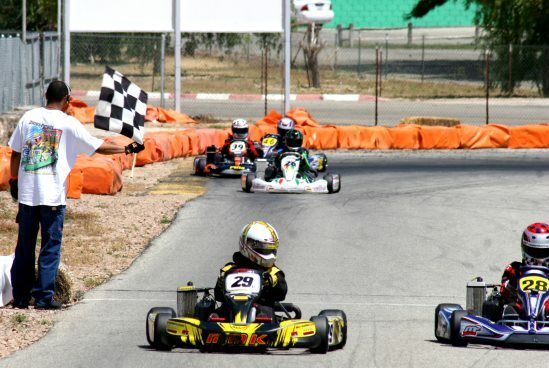 4 Races in this season so far at the XPlex, and the second red flagged race! I had a great start in my heat race, went from 3rd to 1st by the first turn. Too bad it only lasted a couple of laps: I got passed by Austin Isaac for 1st. 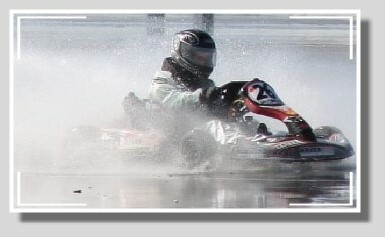 When I went on to get my position back, I nailed a dirt pile and flew out of my kart. Luckily I was ok. I wish I could say the same for my kart and my helmet...! 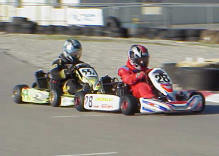 Round 2 of the Gatorz Series was held at the Rocky Moran Raceway. I made best laptime of all in practice, but I had a bad start in heat and main race. So I did spent all my time working my way back up to my starting position. I finished 6th, knowing I could have done better. It was the first Gatorz for my sis Desiree - and I think she has done great, finishing 8th out of 12! What a great Race at the XPlex! We ran the practice and qualifying in dry, but very cold conditions, which actually supported my Mojo Tires a lot: I finished pole! The only one big dark cloud over the XPlex let it rain right on time for the pre-finals: We did not change tires - everybody ran in slicks; there were some really nice 360 spins....! After all I did finish 2nd in the pre-finals and in the finals, where I was battleing with Roger for the first place. 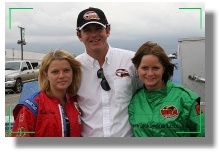 With this first Champ Car Rotax Kart Challenge at the XPlex I have opened all my race series for the season 2006. 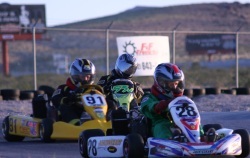 It was a great day at the XPlex Racetrack, and I had a very nice time with all the guys, coming from Utah! I finished 5th, but I think I make it better next time! XPlex Season has started again! 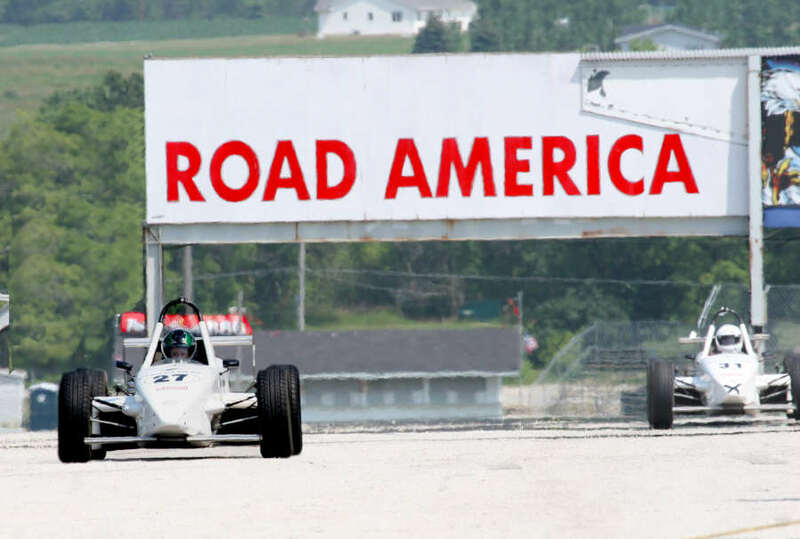 I didn't expect 10 Rotax Junior Drivers on the grid, because 2 of the last years Juniors (Josh and Jacob) are racing in the International Class this season, and some others have moved out of state. Good Race, but Bad Luck at this 4hour Race (Clutch broke, Water pipe broke, Chain broke...! ): Our Team 2TurnTables & a Microphone with Matt Kaiser, Peter Hearn, David and me did start at the very last position (21), but made it to position 3 in only 3 laps and from lap 15 on we have been the leader until the clutch broke. We dropped 11 laps for repair, but we finished the race (14th place). After all it was a big success for James Perez! 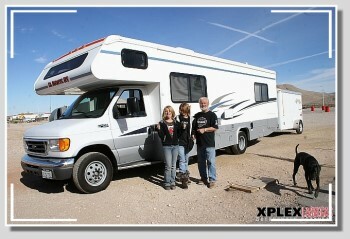 Our Team made the 3rd place at the Las Vegas Speedway! This was my coldest Race I ever made... brrrr! 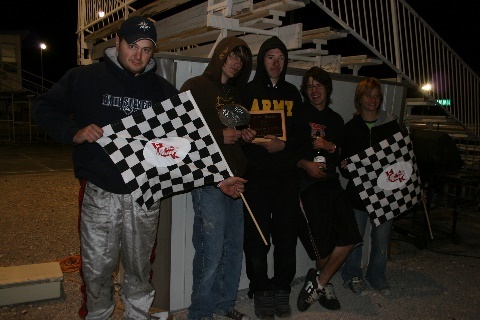 It was freezing cold when we finished at 6pm at the Las Vegas Speedway, but it was a great experience for me. my best lap time ever!
. ..at the XPlex Racetrack: 11 competitors from across the country met for the annual "Criterium"-Race - I was impressed about their performance with the bicycles on the acetrack! My 2nd podium finish this season and the first Race for my younger sister Desiree. at the XPlex. This was cool: I met Gary Carlton (5-times winner Stars of Karting) and Diego Valverde (General Manager Trackmagic Racing Karts) and Troy Simmons from the Trackside Performance at the XPlex. 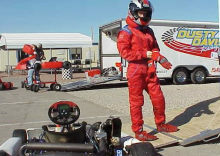 They did 3 days testing for the new yokohama kart tires and I had the opportunity to drive my first Trackmagic TAG Kart! My best lap time in the Main Race was 50.642, but than I had bad luck and crashed with Zac Clark, that's why I finished at place No.7. 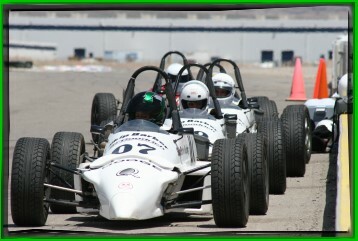 at the XPlex Racetrack from 6pm until midnight...	My first race in a super team with a World Formula Motor: 347 laps! And we won! It was my race No.4, and I got my first podium finish! And it was not an easy win after a heavy tackle with Devin. I have never been before on another track than my hometrack XPlex. 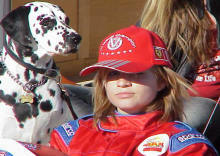 This race was held at the Las Vegas Speedway, which is located up in the north of Las Vegas. Under these circumstances I made a good lap time, but I had a little bad luck too. 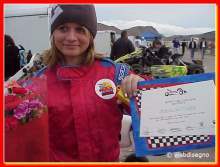 My 2nd race for the XPlex Championship 2005 was held with 80 degrees fahrenheit (27 grad) in Las Vegas on the XPlex Racetrack. 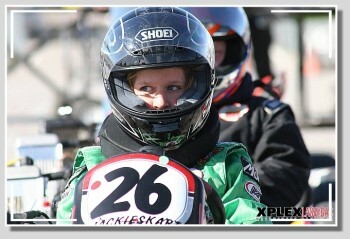 I ended up on the 4th place in Rotax Junior! 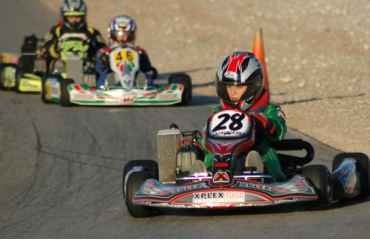 My first race for the XPlex Championship and RMax-Challenge 2005 Series - I made the 5th place in Rotax Junior! Very important: the day before my first race. 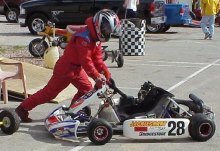 I take Zach as my inspiring example; he is racing for Rotax International. Look at the pictures, his suit has an awesome color! My Birthday-Race! I was totally surprised! I had no clue all my friends came to the xplex racetrack where my parents arranged a little birthday-picknick for me! Practice on a warm sunday with Josh and Taylor. Both have a Rotax 125cc Junior like me. 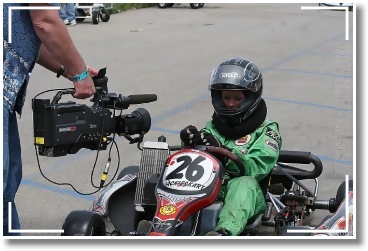 My first own Rotax 125cc Junior Kart! 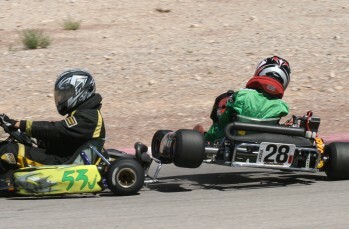 Practice with my first go kart Rotax 125cc Junior on the XPlex Motorsports Racepark in Las Vegas. 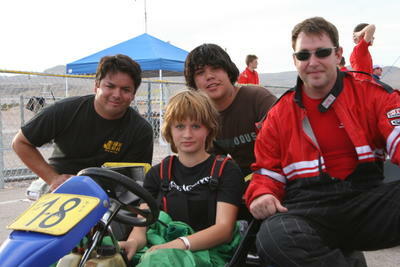 Ken Northrup is my teacher and showed me everything what I have to know to get my kart running. I broke my own record! I made a new record: .5398!